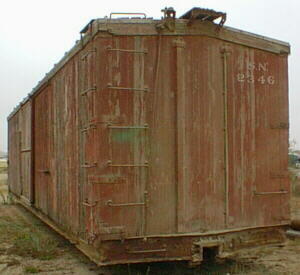 This boxcar was recently acquired by the SMVRHM and will become a renovation project. Ordered in 1919 as one of 25 boxcars, this and the other boxcars were built by the Mount Vernon Car Manufacturing Company. They were delivered to the Sacramento Northern Railroad in 1919 and 1920, and were numbered 2129 through 2153. They kept these same numbers on the merged Sacramento Northern Railway (SNRy) after 1929. We recently (December 2002) discovered that our boxcar's original number is still stenciled on an inside wall, albeit under a layer of paint. It can still be read by positioning yourself just right - 2129! It is similar to other boxcars delivered to the Western Pacific in 1918-1919. AFE (Authorization for Expenditure) 10-48 dated 9 Oct 1948 authorized a rebuild of the surviving cars. The Arch Bar Trucks were replaced with Andrews Trucks, and AB Brakes were installed. Cars so rebuilt were renumbered 2329-2350, but NOT in the original order (maybe in order rebuilt). The car's present number is #2346. The California State RR Museum has #2350 in its holdings. The Sacramento Northern Online web site has two sections with info on their old boxcars: Steel-underframe Boxcars, and Roster Of Surviving Sacramento Northern Locomotives and Cars. These cars were retired in the late 1960s and early 1970s (all were cleared from the SNRy by 1975). #2346 was bought and moved to a south Blosser location (former Cal-Maria) in 1975. It was acquired by the SMVRHM in 2001 and moved to another storage location. The hole in the lower-left corner of the door (see upper-right picture) was due to a dog being confined in the car - he clawed/ate his way out.